If you have trouble falling or staying asleep, wake up too early, experience non-refreshing sleep or some combination of symptoms, Janet’s Pillow Talk Program can help you get a great night’s sleep. Pillow Talk is a drug-free, long term solution that uses proven techniques to unwind the behaviors, thoughts, and stress patterns that make it hard to fall asleep or wake you up in the middle of the night. You will learn you how to break the cycle of chronic insomnia and prevent episodes of acute insomnia from turning into a chronic problem. Before you know it, you’ll be sleeping better and feel great all day long! Stop anxious thoughts from keeping you awake at night. Fall asleep faster with stress-relieving breathing exercises. Reset your body’s sleep-wake cycle. Unwind behaviors that are keeping you from a good night’s sleep. Feel calmer during the day and sleep more soundly at night. Look forward to a great night’s sleep. Wake up feeling energized and ready to go! 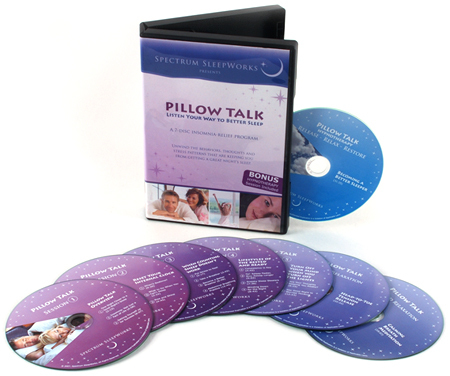 The cognitive-behavioral techniques used in the Pillow Talk Program are scientifically proven to be effective. The program also includes several stress-relieving practices that will lower your stress during the day and night. The sleep strategies and relaxation exercises in the Pillow Talk Program will help make you a better sleeper for life. Be one night closer to a great night’s sleep!